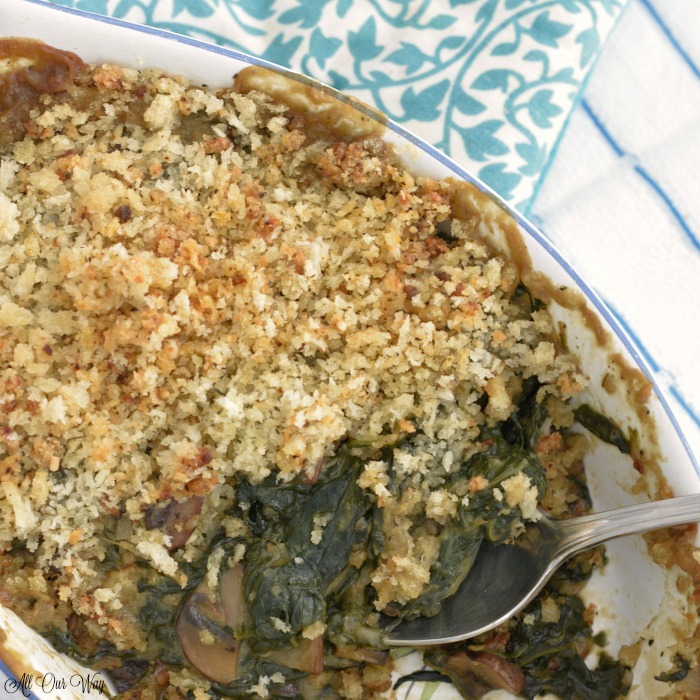 Our Spinach Gratin starts out as many of our recipes do. I check the fridge’s vegetable drawer, spot one bag of baby spinach approaching the sell date and next to it is a one-half carton of Portabella mushrooms losing their freshness battle. “What are we having with the grilled chicken?” asks Honey entering the kitchen. “Spinach with mushrooms,” I answer. “Do you have a recipe for it?” he asks. I decide to use Parmesan cheese instead of the Gruyere; we always have the parm on hand. Instead of the milk or cream cheese, I figure I can substitute chicken stock for the milk and cream cheese, then thicken the liquid with flour. Instead of the shallots, another ingredient I didn’t have, I can use minced onion. At least I do have the butter, salt, pepper, and nutmeg. Julia doesn’t use mushrooms, but this dish will have some. Now if you don’t like mushrooms, don’t add them. Whew!! That is six too many steps for me. Instead, I decide to make the spinach gratin like I make my garlic spinach. I sauteé the garlic and onion. Then I add the mushrooms until they turn a golden brown. Finally, I add the baby spinach, pour a little of the chicken broth in the pan and cover it with a lid. Before pouring the mixture into a buttered gratin dish or glass casserole, I stir in some of the Parmesan cheese. I sprinkle the parmesan panko crumbs on top of the spinach and bake in a 375 degrees oven for 30 minutes. The spinach was the best we’ve ever eaten. We hope you think so too. 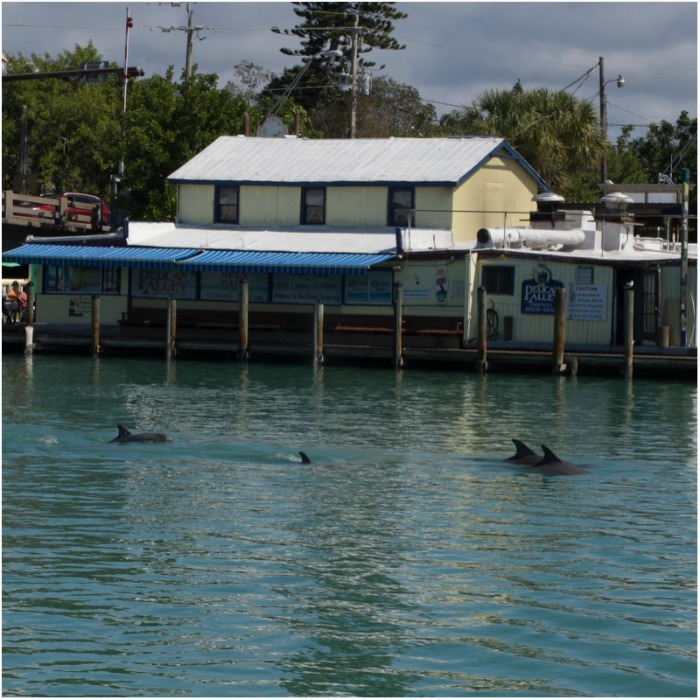 Be sure to sign up for our weekly newsletter; we love sharing our recipes and adventures. This spinach gratin is brimming with flavor but isn't loaded with cream and cheese. The rich taste comes for thickened chicken broth and Parmesan cheese. The gratin is topped with a buttery crunchy parmesan breadcrumb topping. In a deep saute pan heat the olive oil and 1 1/2 Tablespoon butter over medium high heat. Sauté the onion until translucent about 2 minutes then add the garlic, hot pepper flakes and cook for another minute. Add the mushrooms, stir and continue to sauté until they begin to turn golden. Slowly add the spinach leaves until they begin to wilt. Add 1/4 cup of the broth, add salt and pepper to taste, cover the pan with lid, and cook over medium heat. Once the spinach wilts, about 5 minutes, uncover and continue to stir. Don't let all of the moisture evaporate. You may have to add a little bit of water. In the remaining 1/4 cup chicken broth whisk in the flour until it's dissolved. Slowly pour the broth over the spinach and mushrooms and continue to stir until thick. Add a dash of nutmeg. Stir in 2 Tablespoons of the Parmesan cheese. Pour the mixture into a buttered gratin pan or glass casserole. In a bowl mix the Panko crumbs and Parmesan cheese. Melt the remaining butter and add that to the topping and mix well. Sprinkle the topping evenly over the spinach gratin. Bake until heated through and slightly golden brown on top, about 30 minutes. 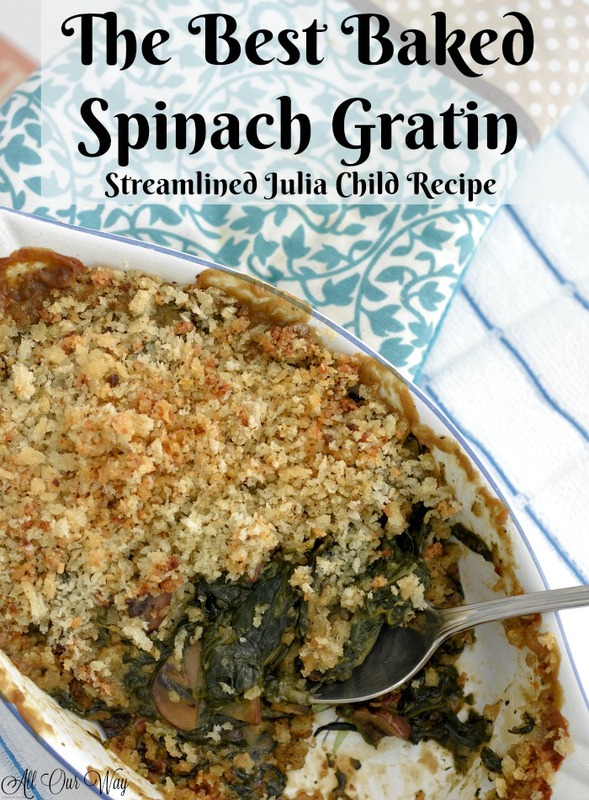 I am a huge julia fan and spinach! I bet this smells fabulous cooking too .. Not sure there is a better way to prepare spinach than this dish it really changes it up perfectly to a whole new level. All my mom ever did was fry it in garlic and red pepper flakes. I still do that but add it to a sandwich! LOL great dish will try this! I like the simple and easy list of ingredients. This is really a great recipe. Very tasty and quite original. I love it! I am going to try this out. Thank you. I think I can even get my kids to eat spinach and mushrooms when mixed with butter, cheese, and breadcrumbs – sounds so good! What a great comfort food side dish! Yum! The fella just loves spinach, especially when it’s creamy like this. It’s also the one way I know that I can sneak some mushrooms into dinner without a fuss. Your recipe looks beautiful! This looks like a GREAT side dish. Perfect for taking along to potlucks too. We ALL love spinach in our house. Perfect pairing for a great BBQ’s steak….this would be a crowd pleaser for sure. yum! need to make this later this week! Hello, Veronika. Let me know how you like it. You cook like I do. . . I’m always opening the fridge and thinking hmmm what can I make with what’s in here. This one sounds like a keeper! This looks so lovely! 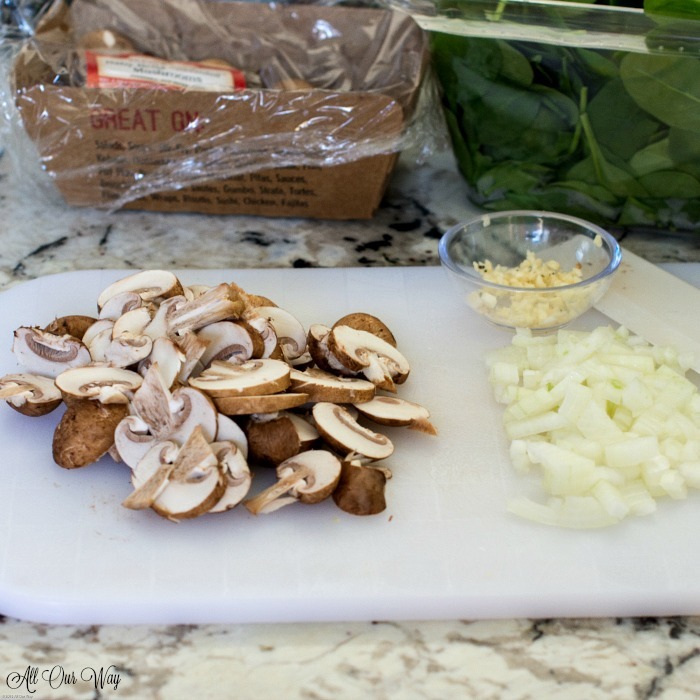 I’ve never had spinach prepared like this and it seems like a wonderful addition to any meal! 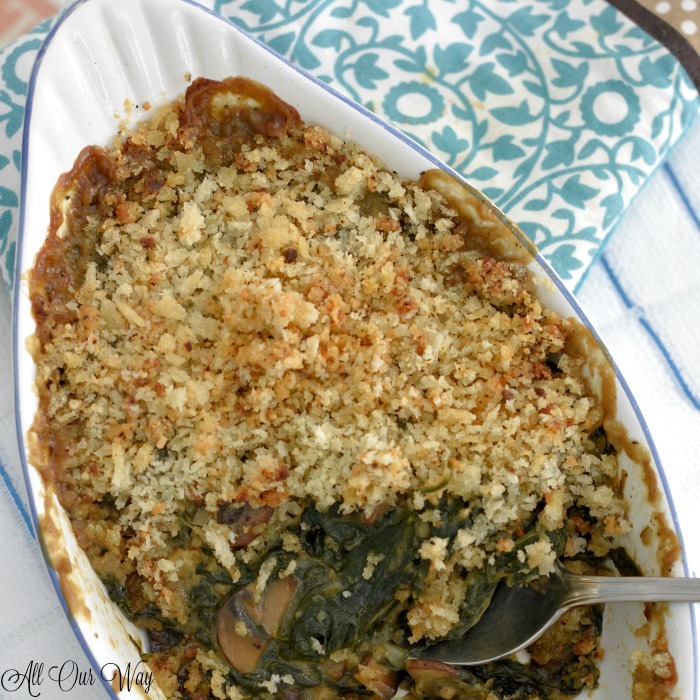 I’ve never thought of spinach for gratin, but it looks so good! We eat a lot of leafy greens so I’m always looking for new recipes – I bet this would be great with kale too, once the early spring kale CSA starts! I think you’re right about the kale, Julie. I was planning on doing that with baby kale. I really love the creamy, cheesy gratins but they are so high in fat and calories. This to me is a great tasting alternate. Wow! I’ve never had spinach gratin before. This looks so delicious, I love anything with a good crispy crust. Hi, Ashley! You’re going to have to give it a try. The crispy crust really adds to the overall taste. We food lovers, work even better under pressure!!! Spinach gratin, looks delicious, love everything that has gone into it, a complete meal!!! Spinach is not always my most favorite veggie, however you’ve combined it with some other tasty ingredients here and I bet this is really good. You can never really go wrong when you start with a Julia Child recipe! This sounds good and easy to make. I will try this with my mom. She loves spinach. Hello, Chei. I’m sure your mom will enjoy it — it has a rich creamy taste. 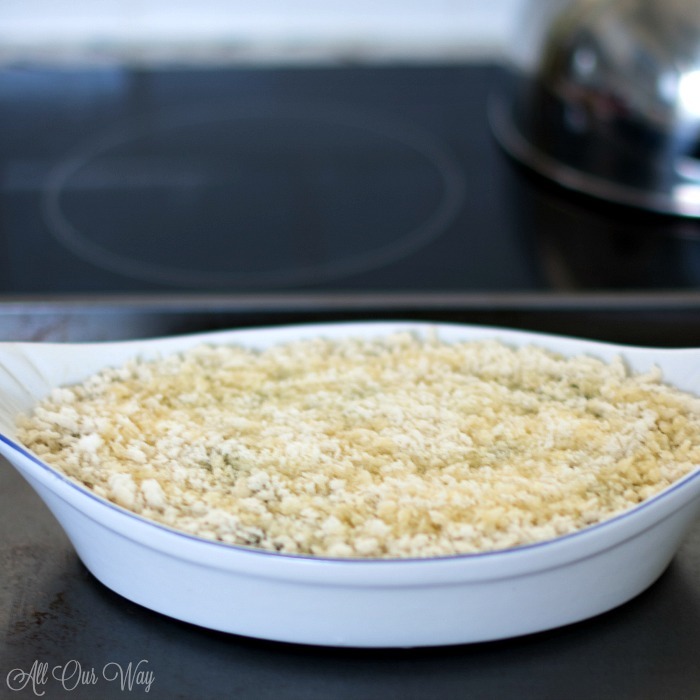 Love yummy casseroles and this is perfect to use anything you can find on the fridge. Spinach is so tasty combined with the cheese yummy! You are so right, Maria!! This looks really fantastic. 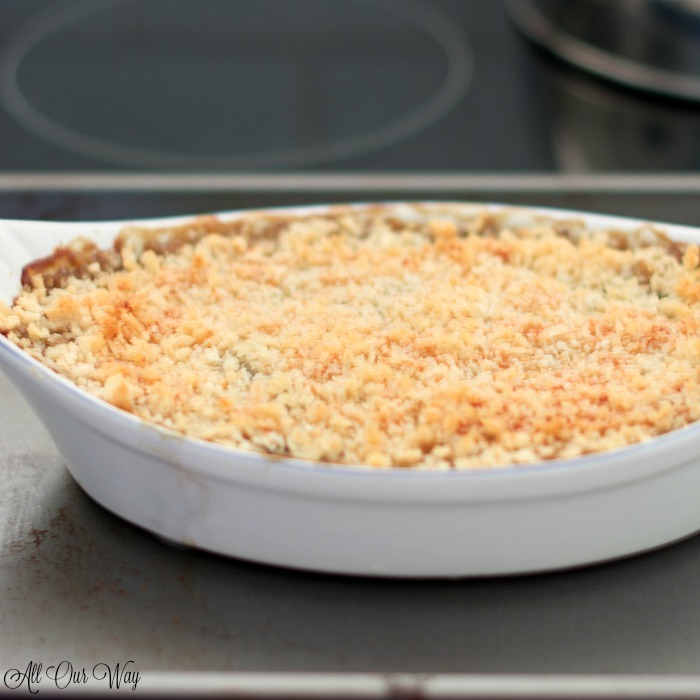 I love a good gratin – it screams comfort food to me! I’ve actually never had Gratin (crazy, I know!) but this looks especially amazing! Can’t wait to try it out! Hi, Christine! Try it, you’ll like it!! Seriously, though, it is so tasty it easily can be a company side. You’re welcome, Stephanie. You know, I always try to plan my meals ahead but sometimes it just isn’t possible. And we too always have mushrooms in our fridge. Bless Julia Child! This dish looks scrumptious and then best part is it’s not so complicated! Will go great with Sunday’s Grilled Steak Dinner!! Grilled steak dinner?? Oh!! That sounds so good and the spinach will make a terrific side. Come dinner time, opening the fridge and looking for ingredients to use up is exactly what I do here at home too. Spinach and mushrooms are also items we always have sitting in the fridge. I’ll keep this recipe in mind for next time! Hi, Tina! I’ve got arugula now that is getting to “that” point. It’s on the menus tonight. Pizza with arugula. That is how most of my blog recipes start out too. If it works I will post it! And I too often grab what is about to expire out of the fridge and ask how can I salvage this? This is a great one for me as I always buy so much fresh spinach and can’t finish it before it gets about ready to spoil! Hi, Jennifer! Hope you try the recipe — it certainly is easier than Julia’s recipe. You can never go wrong with a Julia Child recipe!! She wrote the book on cooking! I love how you piece your ingredients together and come up with such a fabulous dish!!! Oh oh… that’s my style of cooking.. Take a break from my work. Open the fridge – look at how much time I have on hand – then decide what can I serve in that time. Some time luck in my favor and I have enough time if not i’m scrambling…. these are times when some of the best recipes surface..! Well, you came up with a delicious alternative to what your normally made with spinach. I hope the husband was happy. Hi, Linda! Hubby was perfectly happy! Got any ideas for fennel? Hello, Pam! This is really an easy recipe. If you make it let me know how you like it. Hi, Byron! It’s fun coming up with something new. I’ve got a fennel bulb in the fridge now that’s calling my name. Grazie, Chiara! Abbracci e buona settimana a te. I love baked veggie dishes and this sounds so good. Looking forward to trying it. I agree “necessity is the mother of invention” especially in creating great recipes. I like your version better and more to my taste. I bet this dish came out a winner. Will definitely add to my recipe file because spinach is my favorite vegetable and this recipe looks delicious. Good morning, Jovina! We do eat a lot of spinach, whether it’s fresh or frozen. Hubby could eat it several times a week, he really doesn’t complain. I’m the one who is always seeking for culinary adventures — only ones that don’t require an entire day especially when we’re not home. Happy Sunday.